The best granite sealer for countertops in your home is MB-24 Granite Sealer from MB Stone Care. It’s also the best granite and natural stone sealer for hotels and commercial spaces too. Beware of granite contractors or salespeople telling you to seal your granite countertops every 6 months or every year. If that’s the case, you’re probably dealing with poor quality top coat sealers! Properly sealed with impregnating sealer, your granite and other natural stone tops will be protected for 10 years or more! You can seal granite countertops yourself with professional quality results using MB-24 Impregnator/Sealer from MB Stone Care. Your granite counters may or may not need sealer. Granites vary in how porous they are and how susceptible to staining they are. Actually, the color and patterning of your granite can indicate how porous your countertops may be. As a professional granite countertop installers, we’ve used MB Stone Sealer for more than 10 years and have found it to be the best performing granite sealer. Depending on the absorbency of your stone, more than one coat may be needed for full protection, but you won’t need to reapply for 10 years or more. We provide heavy duty trigger sprayers with each bottle of MB-4 granite sealer. The easiest way to apply sealer is to spray a small area, spread sealer uniformly over the area with a clean white cloth, let the product sit for approximately 10 minutes to allow maximum penetration. When the sealer is almost dry, spray a little more MB-4 on the stone and rub immediately with a clean dry cloth until residue from the sealer is removed. Allow 24 hours to cure before using the countertops. Click on Sealing & Color Enhancing in the MB Stone Care catalogue for more helpful products! Unlike silicon sealers, MB-24 will not evaporate or go through any type of natural deterioration. This sealer will prevent liquids from being absorbed by all natural stones – MB-24 sealer. 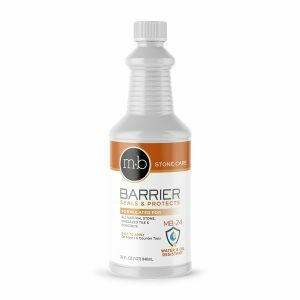 MB-5 Marble Granite and More Spray Cleaner is your daily cleaner for natural stone including granite countertops. Effortlessly and effectively clean your stone countertops without leaving any streaks.